We all want to leave a legacy. And particularly while we're alive! 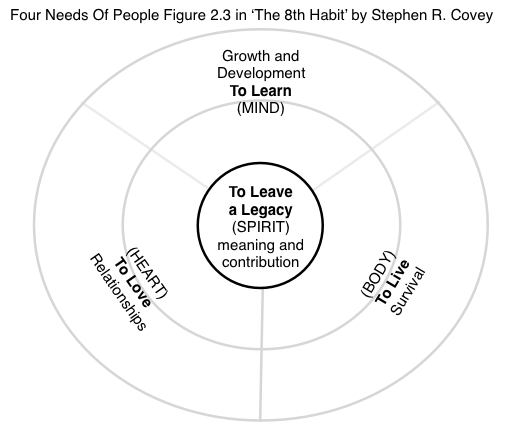 Stephen R. Covey says this is one of four basic human needs and motivations of all people. More from Stephen shortly. I've been reflecting a lot on legacy lately as I enter what may turn out to be the swansong period of my business life. This led me to zeroing in on what my clients value the most, which in turn led me to the design of my possible swansong work which I explore here. Being willing and able to fully appreciate and get the best out of themselves and other people tops the list for my clients. Stephen R. Covey's book, The 8th Habit From Effectiveness to Greatness, and my favourite of his works, sheds wonderful light on this subject. 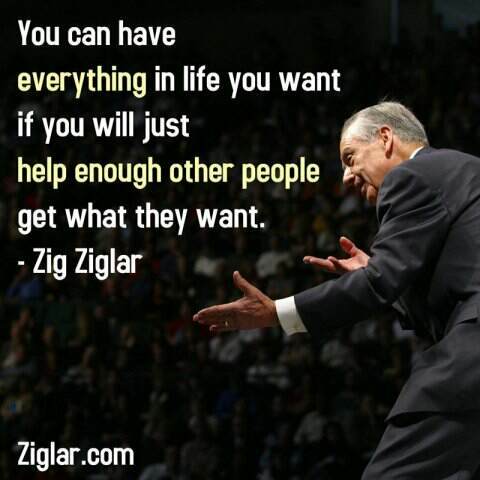 The 8th Habit is Find Your Voice and Inspire Others to Find Theirs. 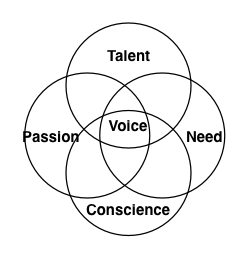 Covey defines voice as "unique personal significance" which he illustrates in Figure 1.2 in the book as pictured below. I've been privileged in my own best way to help many people to find their unique personal significance (voice) over the 45 years of my working life so far. So leaving your legacy while you're alive has much to do with Stephen R. Covey's 8th Habit: Find Your Voice and Inspire Others to Find Theirs. If you'd like some help please give me a shout. How are you measuring what's meaningful? My number of true fans is 28. What's your number?